We let the football sim loose properly this weekend, with percentage chance forecasts for each game and I stuck my neck out with betting choices too. How did it go? Overall, seven out of ten. Literally! Seven out of ten results called correctly, which isn't too bad at all. Admittedly it wasn't the most difficult week to predict, with the top sides mostly playing teams that they were expected to beat and those games running to form, but still, you can only beat what's in front of you. As the pundit said to the viewer. Link to last week's percentage chances and predictions if you want to take a look. If you want to use the model for betting - and Twitter is telling me that some of you definitely do! - then I was trialling a new method last week. The method picks results that are 'over-predicted', so if 25% of games in the model are usually a draw and the model's prediction for a single game is a 30% chance of a draw, then there's a good chance that's what we'll be betting on. What this method seems to do is steer the model towards predictions that aren't already priced into bookies odds. There's no point in betting on home wins unless they're over-predicted, because the odds are rubbish and you'll just slowly lose money. I've simulated betting just on the highest chance result and the latest version of the model would end a little down across the whole season so far. This new method, as well as allowing us to bet on draws (read last week's post for an explanation), also swings us towards betting on slightly more unlikely events, but ones that have better odds. Man City's win last night completed the fixtures and with a £10 stake on each game (£100 total), you'd be up £26.30. I've said before that the model overcooks Arsenal. It's very frustrating... although possibly more so if you're an Arsenal fan. The simulation is based to a large extent on passing and attack - it doesn't do glaring defensive errors yet. Maybe an indication that if Wenger could sort the Arsenal back four out, they'd be doing an awful lot better. Anybody reading who didn't already know that? Let's move on. 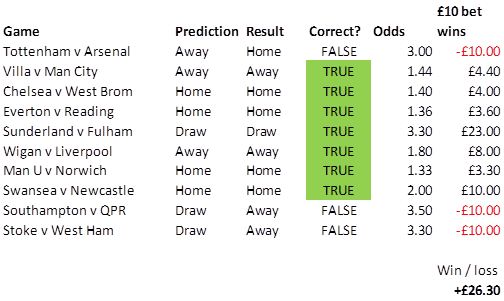 The other two results the model missed were predicted draws at Southampton and Stoke. Both missed by just one goal. For betting purposes, I'm happy with that because if you can call roughly one draw in three, you'll break even and this week, the correct call on Sunderland's draw covered the other two, plus a little extra. 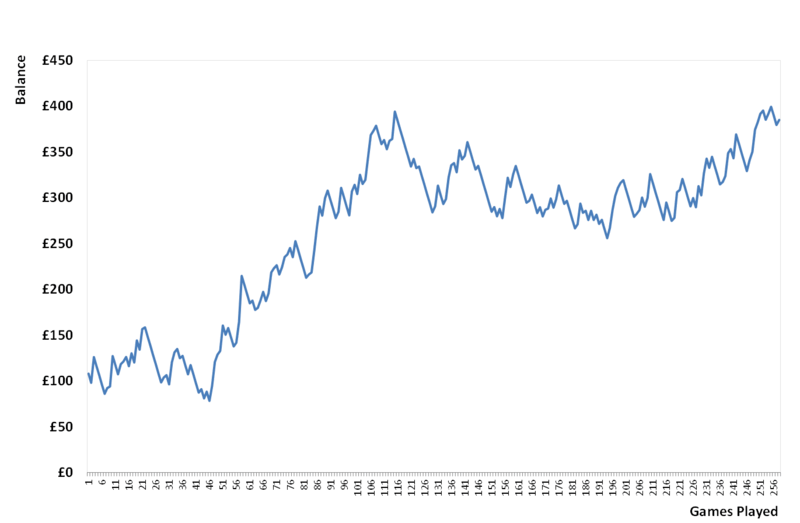 What would have happened if you'd followed this £10 betting pattern all season so far? Starting with 100 quid in the bank, you'd now have £380, not including this week's win. If you're thinking it looks slightly odd, this chart shows games being played one at a time, not in weekend blocks of ten. I'm still not building this primarily as a betting model, but well, it's kind of hard to resist when the chart looks like that. A couple of (potentially big) caveats in the interests of honesty. I'm still running the full season sim using player stats for the whole of this season. This means the model knows about things like Michu's, Bale's and Van Persie's goalscoring form before the bookies did. That's not strictly fair but from now on, I'm calling results before the event. I also don't know when the odds that I have (from www.football-data.co.uk/englandm.php) were scraped. The model knows actual starting line-ups for each game and those odds may be from the day before kick-off, when injury niggles etc. were still in doubt.